Here's the dirt on promoting better herd health. 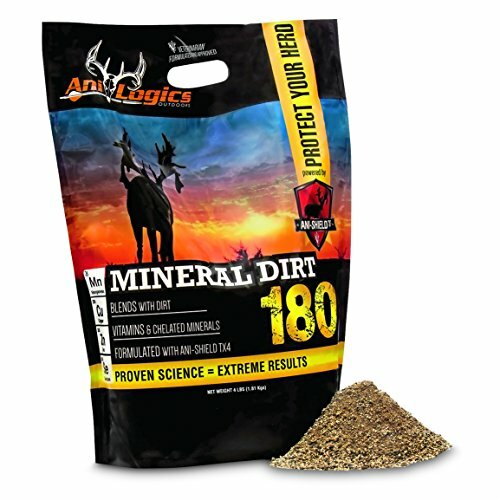 Grow a healthier herd from the ground up by spreading Ani-Logics Mineral Dirt 180 around your property. This easy-to-use and efficient method for promoting herd health is formulated to make up any deficiencies in diet. The proprietary Ani-Sheild TX4 formula adds essentials such as Copper, Zinc, Manganese and Selenium, which promote antler growth and probiotics and oils to improve digestive health. Powerful attractants will pattern and holds whitetail on your property. Blends naturally with dirt to create a beneficial deer mineral lick; Formulated with vitamins and chelated minerals are more easily absorbed and improve immune response and body growth; Ani-Shield TX4 is a veterinarian formulated proprietary blend that maximizes genetics to promote health and antler growth; Proprietary whitetail attractant will pattern and hold deer on your property; Quantity: 4-lb. bag; Mfg. Number: 30704; Order today! If you have any questions about this product by ANILOGICS, contact us by completing and submitting the form below. If you are looking for a specif part number, please include it with your message.